A good washing and polishing can make a car look like new. The problem is that few people know how to do it well. So here’s a guide that will put you into the category of those who know the tricks of the trade; you know, like the professional detailing guys at Lee Chrysler Dodge Ram Jeep! Make sure you use three wash buckets to wash the exterior of the vehicle and at least two wash mitts. One bucket should have in it a car wash shampoo that is safe for all surfaces, while the other two should have just plain water. Here’s the procedure: You can start by taking a wash mitt, dip it into the soapy water bucket and then start washing your car. When the mitt is good and dirty, rinse it in the first water bucket and then in the second bucket before you dip it back into the soapy water bucket. This makes sure that a minimum of grit and dirt stays on the wash mitt because you “double rinse it”. When you are finished washing the entire car, rinse it thoroughly, ensuring you have removed all soap from the surface. Polishing is the act of using an orbital polishing disc to sand off just a tiny fraction clear coat. so that it may be more evenly distributed across the car, thus filling in any scratches on the surface. 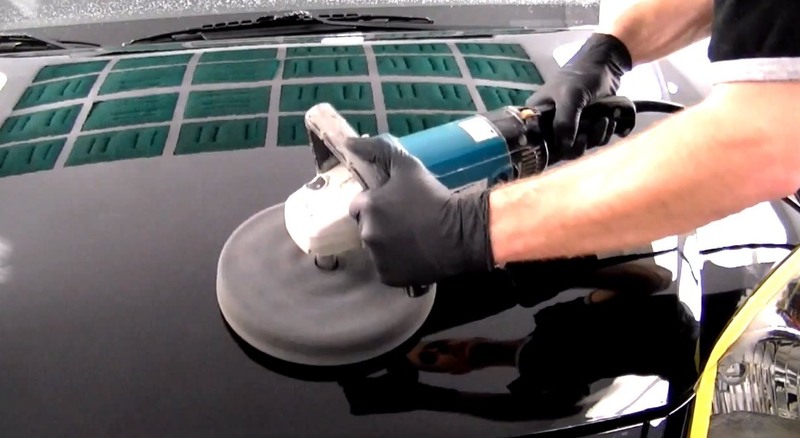 Mild rubbing compounds are generally used during this step, and care should be taken, to prevent any swirl marks or “burning” of the clearcoat. Here’s the procedure: The car is first washed and before it dries completely, a detailer will apply a coat of compound to one area of the car via the orbital disc. Long, slow movements with gentle, even pressure are key here. Just be sure that both the polishing pad and the car have a slight amount of water on them at all times to keep the paint protected. There are three ways to protect your just polished car. You can wax it or you can seal it. Here’s the difference. A car wax always contains some type of natural wax-like substance. A paint sealant on the other hand is always wax-free, and is usually made from synthetic compounds and contains polymers as a substitute for the wax. The choice is ultimately up to the car’s owner at the end of the day as to which approach he or she prefers. For directions on how to perform waxing or sealing, consult the manufacturer’s instructions on the bottle or can. Each varies to some degree and it is important that they be applied properly.